The Ionian group, like their most famous member Corfu, are a cooler, more verdant version of Greece, with more cypresses and olive groves. They feel a bit more European until you get to the beaches which are fine examples of the very best of white-sand-turquoise-waters Greek island perfection. Each island in the group has an independent culture, which runs from the architecture to the food. The best places to stay in the Ionian islands reflect these charming differences. Corfu has long been a favourite of travellers who like their beach break with a side of culture. For about the last 130 years people have travelled to this lushest of the Ionian islands with its mountainous north of steep cliffs and pebbly coves and its flatter, sandier south covered in cypress forests and farmland. The island's bounty has meant it has been historically wealthy and this wealth has been expressed with the construction of great libraries and centres of learning and gorgeous villas. Kefalonia is best known for Caretta caretta - Loggerhead turtles which visit the lagoon just beyond the island's capital Argostoli, Myrtos Beach, voted 'Best Greek Beach' more than ten times, and as the location for Captain Corelli's Mandolin. The success of the book and the film haven't spoilt this unspoilt island and the pretty villages of the story are still pretty - especially those of the charming Livatho Peninsula. Ithaca could almost be described as two islands (it comprises two large pieces of land joined in the middle by a slim strip). Famous as the home of Odysseus (though historians and archaeologists are not so sure now), there's plenty of culture, plus lovely beaches, dramatic cliffs and wonderful views. It's a great destination for active sorts with loads of hiking and biking and fantastic sea-kayaking too. Lefkada is called an Ionian island but it's actually connected to mainland Greece via a narrow causeway and small bridge. Despite this easy access and its beautiful beaches and cosmopolitan capital, Lefkada is still one of the least visited islands in the group. Zante is situated to the south of Kefalonia and is reputed to have some of the most beautiful beaches in the region, surrounded by soaring cliffs and turquoise sparkling waters. Kythira, positioned just south of the Peloponnese is another of the 'less travelled' Ionian Islands. Sure, it's well set up for visitors, but it's not as popular as the beauty of its beaches and the variety of attractions mean it could be. It has a reputation of being secluded and relaxing - just like the beaches. As with most Greek destinations, the best places to stay in the Ionian Islands get quickly booked up in the busy summer season. So if you don't want to miss out, get organised and book early! The Corfu Palace is just a 10 minute stroll from the centre of Corfu Town and has wonderful ocean views right across to the mainland. The Corfu Palace was one of the first hotels built on Corfu, so it's got something of the grand old dame about it with private balconies and terraces. 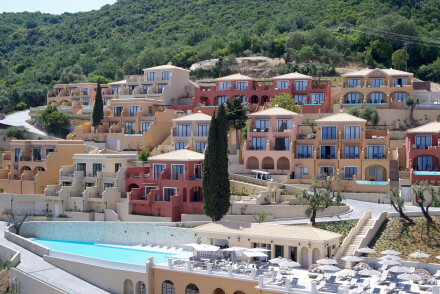 Emelisse Hotel in Fiskardo, Kefalonia is a luxurious choice. With four poster beds, balconies with stunning views and if you stretch the budget you'll get your own pool! 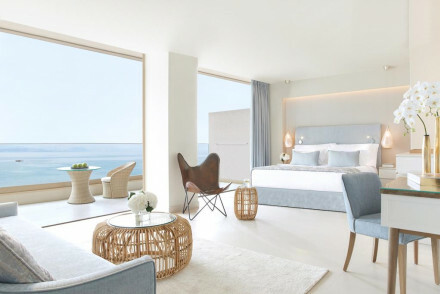 Lefkada's San Nicolas Resort is one of the best places to stay in the Ionian Islands if you want to get away from it all, but still have luxurious contemporary surrounds and all the mod. cons.. Built right over a gentle cliff, this hotel has incredible sea views, a stunning pool and is just a short stroll to the beach. Delfino blu ticks all the boxes being located just above one of Corfu's most beautiful beaches but also close enough to happening Sidari so that you can visit the nightlife. 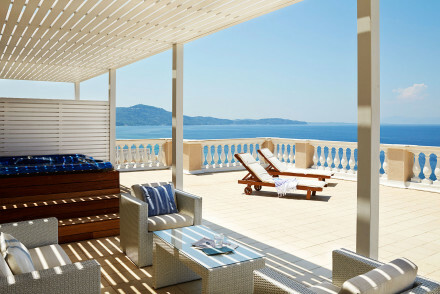 Zante’s Porto Zante Villas & Spa are a collection of luxurious villas right on the coast. There are just ten villas each with a private pool, marble bathroom and a wonderful private terrace facing the ocean. There’s a fabulous waterfront spa, a chic cocktail bar and a Mediterranean restaurant. 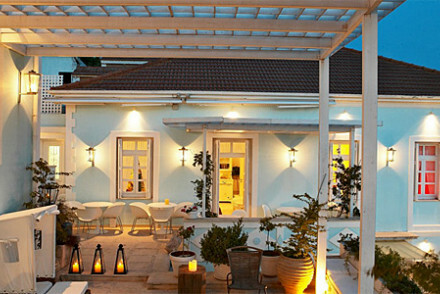 Ithica’s Perantzada hotel is a sophisticated art hotel situated in Vathi. The all-white rooms and suites ooze class and boast private balconies which have wonderful views over Vathi Bay. 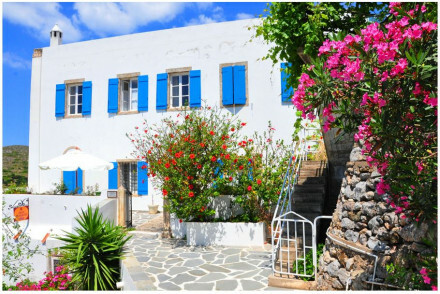 Hotel Margarita on Kythira is traditional and cheerful. Converted from a 19th Century mansion, the hotel is all exposed flagstone floors and stone arches around a courtyard terrace with a beautiful view. Just off the narrow high street, this is ideal if you want to be close to the centre of town and to the beach. With twelve rooms starting from just £42 a night, this is also really good value. Hidden away in the Corfu countryside, the Villa de Loulia is one of the best places if you want to experience some of their lesser known pleasures. Only 400metres from the nearest beach, you're also quite close to the mountains of Perithia and several interesting abandoned villages. This is also a great place for foodies - the gourmet restaurant serves local specialities. If you're looking for something traditional and cheerful then one of the best places is the Hotel Margarita. Converted from a 19th Century mansion, the hotel is all exposed flagstone floors and stone arches around a courtyard terrace with a beautiful view. Just off the narrow high street, this is ideal if you want to be close to the centre of town and to the beach. With twelve rooms starting from just £42 a night, this is also really good value. Corfu's Marbella Beach Hotel is the perfect place for a beach break: five stars and right on a private beach, you have everything you need here and more. Including four different restaurants, watersports facilities galore, an extensive spa, pool and the opportunity to do some sailing or diving. 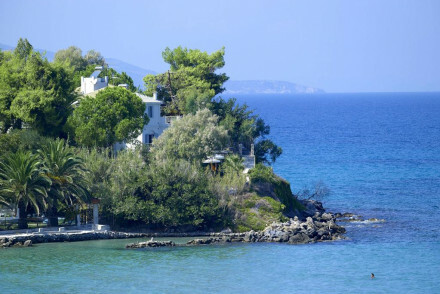 Ithica’s Captain Yiannis Hotel is an unfussy spot offering simple apartments with their own kitchenettes. The property boasts splendid views of the Ionian Sea and you're just minutes from the beach - ideal if you want to spend your days soaking up the sun. 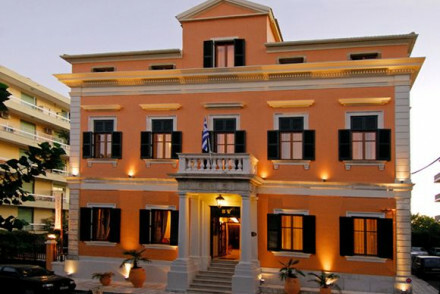 Corfu's Siorra Vittoria is in the heart of old Corfu Town, a gorgeous neo-classical building right by City Hall Square and the Ionian Parliament. Originally a mansion, this hotel is elegant and charming. A good choice for a romantic sunny break. 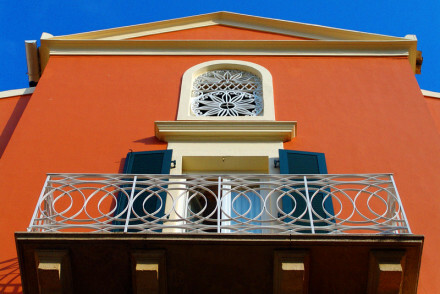 The Bella Venezia is right by Corfu Town's 'Spianada', which is the main street, and within easy walking distance of the main attractions of the town. It's also great value. The Corfu Palace also has an excellent location, just 10 minutes stroll to the centre of town, and yet you still have wonderful ocean views - right across to the mainland. The Corfu Palace was one of the first hotels built on Corfu, so it's has something of the grand old dame about it with private balconies and terraces. 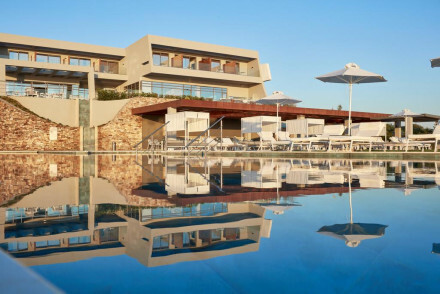 Lefkada’s San Nicolas Resort is a great option if you want to get away from it all, but still have luxurious contemporary surrounds and all the mod. cons.. Built on a hillside this hotel has incredible sea views - on a good day you can see neighbouring Kefalonia and Ithaca, a stunning pool and is just a short stroll to the beach. 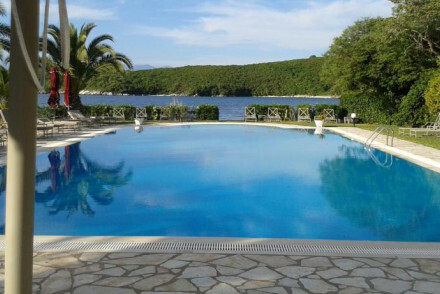 If you're travelling with children we'd recommend the Petani Bay Hotel, overlooking the Ionian Sea on Kefalonia. Luxurious, yet not overpriced, it offers superb facilities including a children's pool and they can arrange activities for all ages. 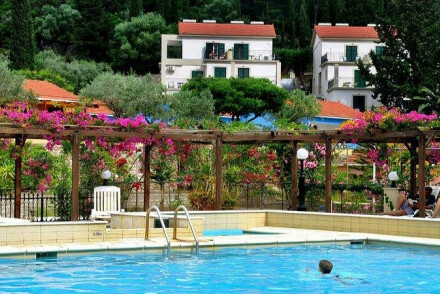 The Sidari Beach Hotel is right on Corfu’s Sidari Beach just a short stroll from the centre of the village. There are 31 elegant and contemporary rooms, a restaurant serving Greek and Italian cuisine and a beautiful pool. 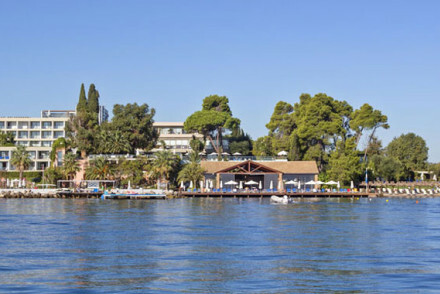 Corfu’s 21 room Bella Mare Hotel describes itself as ‘seriously relaxing’. The accommodation is in studios and apartments - with kitchens and sea-facing balconies - and the decor is chic. There are also lovely gardens and a pool. 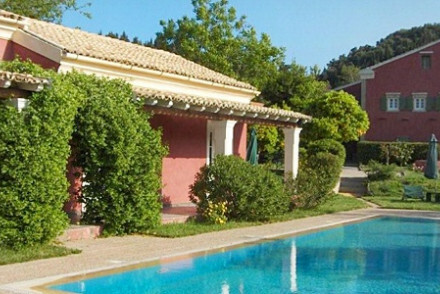 The Pelecas Country Club on Corfu started out as a farmhouse in the 18th century and has 11 rooms in the converted stables and old olive press. The rooms and suites are full of character and they serve a hearty brunch until 11am. Ithica’s Levendis Estate is an ideal choice for families (accommodation is in two bedroom cottages spread around the estate) and is one of the best places for those looking for an eco-friendly yet luxurious holiday away from the madding crowds. 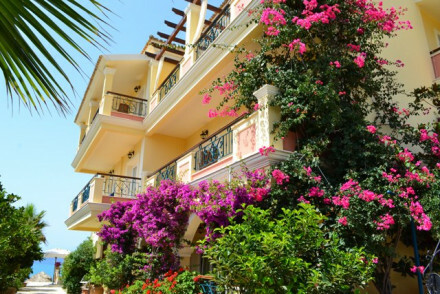 The Bella Vista, a gorgeous, beach facing Greek guest house, is perfect for families on a limited budget. Close to the main attractions and a short walk from lovely private beaches, they have rooms and apartments sleeping from one to five people starting from just £35 a night. 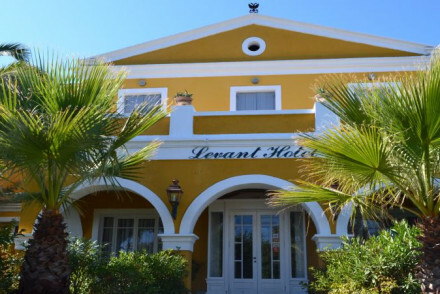 Still very reasonably priced, at less than £60 per night, the Levant Hotel has a more peaceful setting in the hills above the Ionian sea. This lovely neo-classical hotel is a great place to relax if you like a country house hotel vibe. For around £60 per night you can stay at the Melina Bay Hotel, which is right under Kassiopi Castle on the beach. There are just 20 rooms, a Mediterranean restaurant on a scenic terrace and helpful staff. 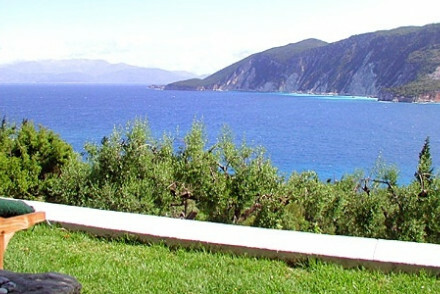 Lefkada’s Aliki Hotel is a quiet, great value 22 room hotel with wonderful views of the beautiful Ionian Sea. The rooms are comfortable and you’re well located for the beach. Prices start from just €70 per night. Corfu International Airport is well connected to the UK, with direct flights available to most major UK airports, and minor ones too during summer. It’s also well connected to other European destinations. Corfu is also a ferry hub. During the summer Kefalonia Airport is also fairly well linked to European destinations, but mostly by low-cost and charter airlines. During the ’off season’ it’s mostly a domestic airport. The same can be said for Lefkada Preveza/ Aktion Airport. Zakynthos Airport and Kythira Airport are also predominantly domestic. The Ionian Islands are well linked by ferry. It’s difficult to pinpoint the perfect time to visit the Ionian Island group, as each island has its own variations, but generally the islands open for visitors around March and get busy from around Greek Orthodox Easter until the end of October when the sailing finishes. Historic lodgings turned boutique hotel with old-fashioned charm. Spacious but simple rooms with period features. A great low cost slice of paradise with sun-kissed beaches and towns for you to explore and relax in. This cute, comfortable and cosy property has apartments, rooms and suites offering wonderful views of the Ionian Sea. Decor is simple yet artistic and includes a sitting area, well equipped kitchenettes and private balconies. Breakfast and light snacks by the poolside are available too. 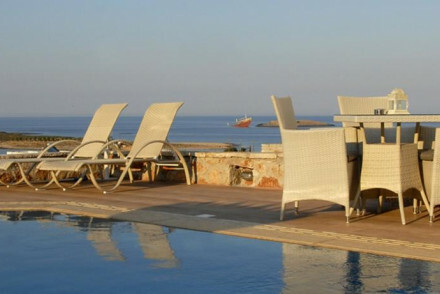 Kythira Golden Resort is an excellent hotel right by the beach in Diakofti. The modern rooms enjoy spectacular seaside views and the outdoor pool is the perfect place to relax and soak up the soothing surroundings. A serene spot for a quiet holiday on a Greek island. Local exploring - A charming and comfortable base to return to after exploring the village of Diakofti and the surrounding coastline. Sights nearby - Venetian Castle and Fortress of Avlemonas are both within three miles. Local markets - Head down to the Diakofti market and pick up some regional produce. Diving - The surrounding coastline is great for scuba diving. A chic all white hotel on the coastline in Vathy. 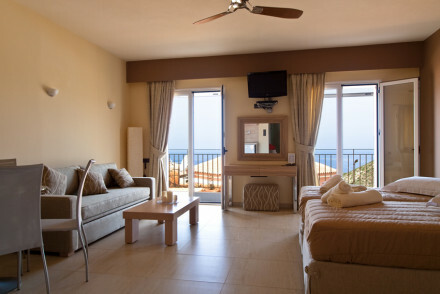 Rooms and suites are romantically decorated, have private balconies, sea views and all the mod cons. Lovely pool and terrace. Walking distance to main attractions. A spot for honeymooners and romantics. 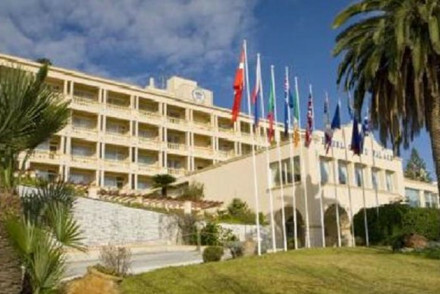 A very well positioned and good value hotel on the coastline with fantastic sea views. A collection of suites with kitchenettes and private balconies, all in muted tones. Lovely pool and relaxation area, restaurant and bar. Adults only. Swimming Pool - Infintity pool with breathtaking views of the bay. Supreme luxury on the coastline. Fantastic rooms and family apartments (sleep up to 5) have all the mod cons, four poster beds, balconies and private pools (some). Excellent spa, restaurant, and boats to charter. Great for an indulgent holiday. A fantastic choice for honeymooners or families. Rustic cottages surrounded by nature and sunny shores with beautiful views. Rambling gardens, wildlife, beaches, and biking. Magical and understated.